With Christmas on the horizon some of you might be thinking of ways to make your home comfortable for guests. 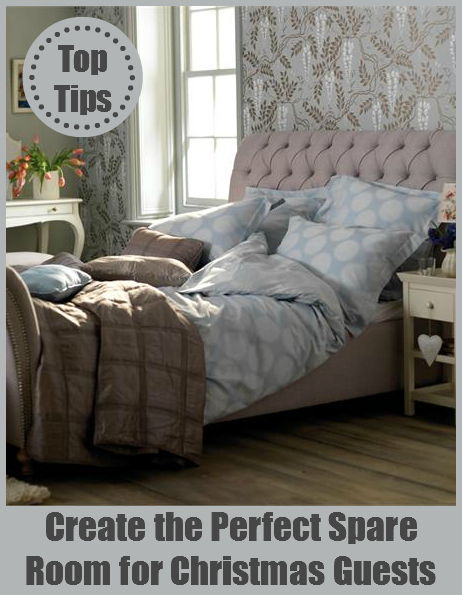 If you have a spare room, and the family are coming to stay I’ve put together some ideas for updating it, or if you’re starting from scratch, these will help you create the perfect spare room. It’s always good to put yourself in someone else’s shoes when you’re decorating your spare room, and try to imagine what they would like from the space. Hopefully these top tips will help you. Add lots of lovely bedding, spare blankets in case they get cold and comfortable pillows. Maybe you can ask if they prefer a certain type of pillow if you’re updating or buying new. If they regularly use the room it’s a lovely touch. You could keep the colours neutral but it’s your home so decorate with your own flair and personality. I’m sure your guests will love feeling part of your home and part of you, whilst they stay with you. Add nightlights for reading, an alarm clock, and a basket of spare toiletries. Keep this on display or hide in the bedside cupboard and let them know it’s there. Offer a selection of books or magazines so if they need some time to themselves they can sneak off and have a read. It’s great for bedtime reading too. If you have them, hang some spare bathrobes on the back of the door. They’re bulky for guests to pack so ideal if you have them to offer. And of course, don’t forget the towels. The softer the better. You may not think of it yourself, but it’s always handy to incorporate a mirror and a chair into the spare room. Your guests have somewhere to check how they look before they make their appearance in the morning, and also somewhere to sit or put their clothes overnight. The image above also shows a desk which could easily transform into a dressing table when the guests arrive. Many of us need our rooms to be multi-functional and a spare room is no exception to this. Make the best use of your space and if you need to incorporate other functions into the spare room, find a way to do so. Take a look below where the spare bed has been sectioned off using curtains. And finally add some fresh flowers or plants for when they arrive to create the perfect spare room ! What do you think? Do you have a spare room for guests at Christmas? Have I missed anything – let me know in the comments below. Whenever I visit my cousin she always has everything you mentioned plus a style of bedding that she knows I like. Tropical comforter and shams. She has bottled water in my room. She’s the best hostess ever. I tell everyone that her home is better than any B&B I’ve ever seen. That sounds amazing Terri! Love the bottled water idea and personal bedding – what a lovely cousin! 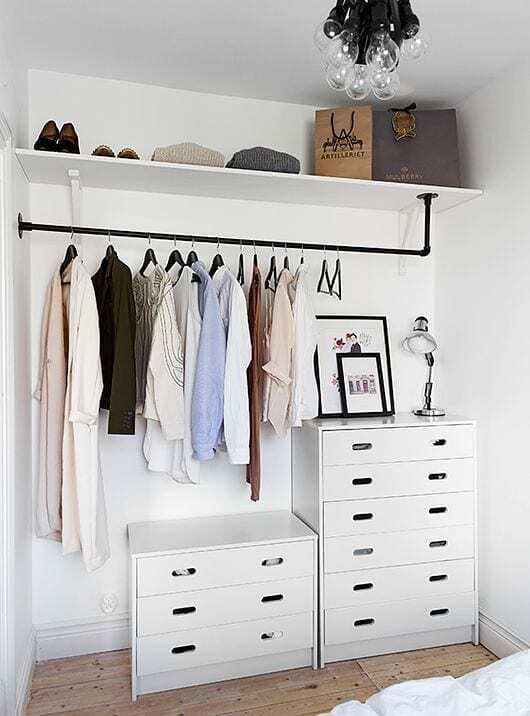 What size bar that you are using in the closet to hang clothes. I need an idea,not to expensive.